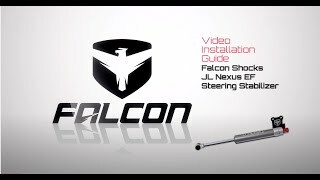 The Falcon Nexus EF 2.1 Steering Stabilizer improves steering feel on daily-driven Jeeps in a compact and affordable package. Fixed-rate Series 2.1 stabilizers have been optimized for on- and off-road driving. Historically, universal shock absorbers and steering stabilizers have been adapted to fit many applications with minimal tuning. Falcon Performance Shocks rewrites the book on damper development. These new shock absorbers and steering stabilizers are engineered to meet the unique requirements of the Wrangler and Wrangler Unlimited. These Jeep-specific steering stabilizers deliver a properly weighted steering feel and consistent bi-directional turning for balanced and controlled side-to-side steering response and an equal return to center dynamics. Built from the ground up with a focus on fitment and function, Falcon’s corner-specific Series 3 Piggyback and Series 2 Monotube shock absorbers and Wrangler-specific Nexus EF 2 steering stabilizers deliver the best damping characteristics possible. After a lengthy and painstaking development process, we have delivered these advanced dampers to the awaiting Jeep market. • Nexus EF 2.1 Stabilizers improve steering feel on daily-driven Jeeps in a compact and affordable package.